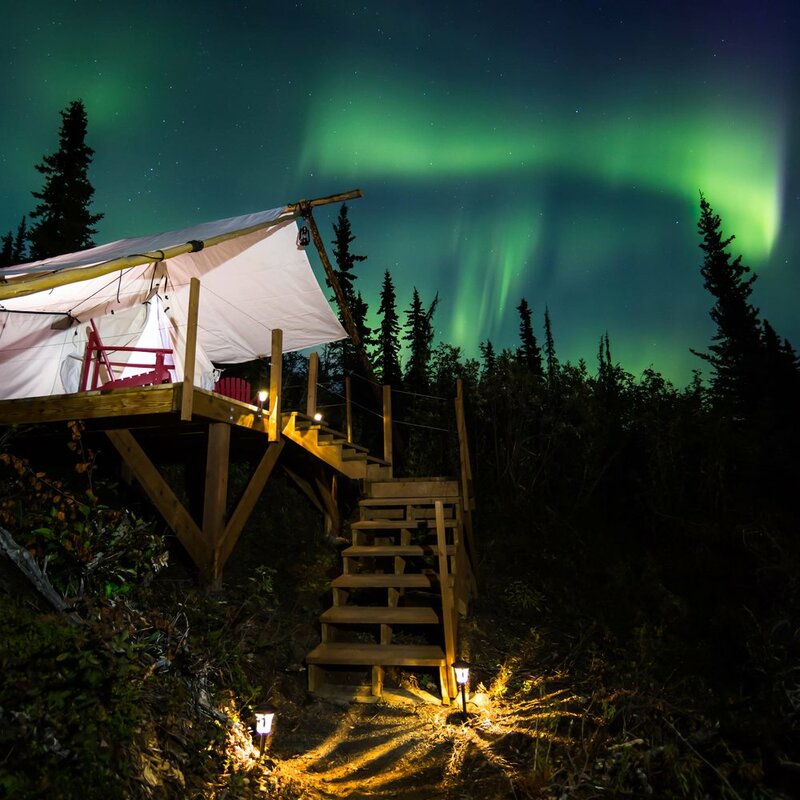 For a unique Alaskan experience, our canvas glamping tents have views and comforts you have been looking for. 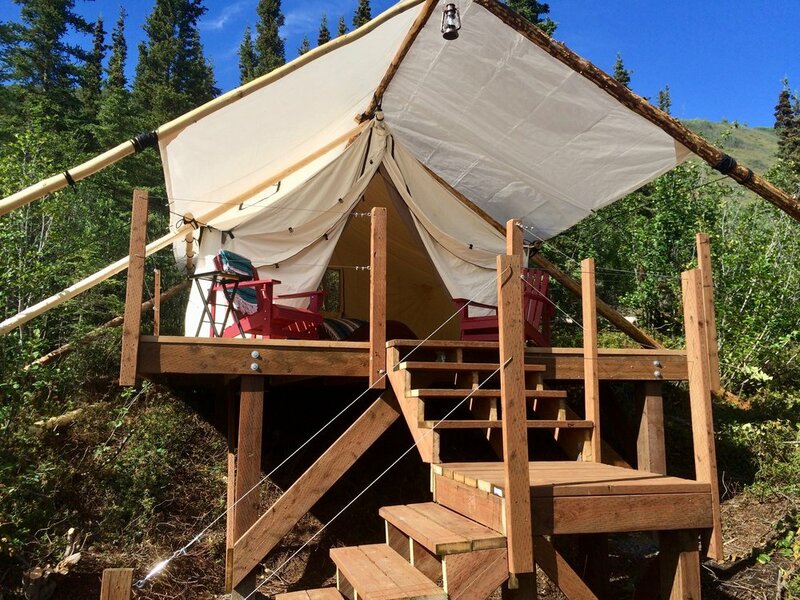 Canvas tents are 12'x14' on a permanent cedar floor with an 8' covered porch nestled in the forest on a small hill overlooking the Matanuska Glacier and valley. 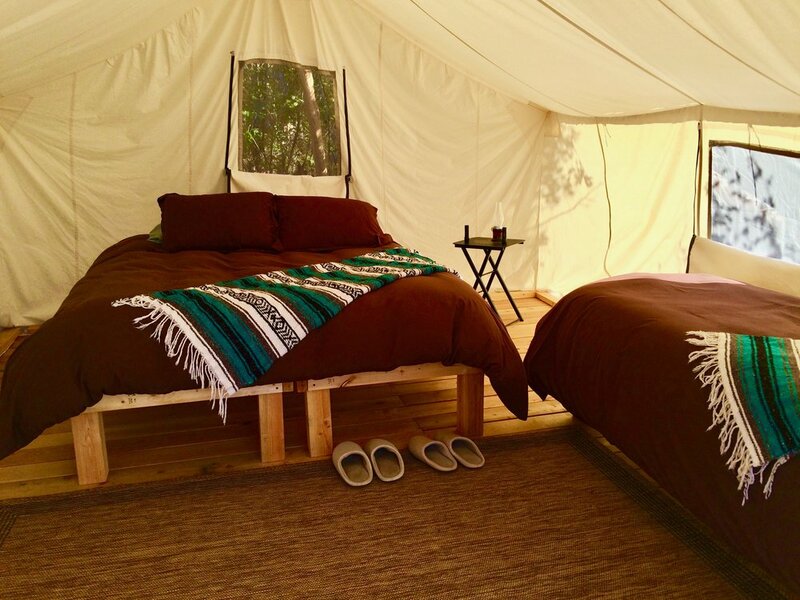 Glamping tents accommodate up to two people (third person upon request) with a queen-size bed. Bedding includes plenty of blankets with a down comforter to keep you warm at night. Two adirondack chairs on the deck are provided for you to relax and enjoy the views. Please have a look through our Welcome Book to see local dinning options, activities, and trails. There isn't electricity in the luxury tents, but you can charge electronics at our common area. A short walk to the common area is where our secluded cedar hot tub is nestled in the woods and is open to our guests in the evening from 7:30pm-10pm. The common area also has a green lawn where guests can sit back and enjoy the Alaskan sun and views along with a fire in the fire pit every evening. We have a very clean, cute outhouse just a short walk from the luxury camping sites or just a two-minute walk to flushing toilets. Complementary breakfast includes: fresh Alaskan roasted coffee, tea, fresh baked goods, eggs, oatmeal, and fruit. We are not a campground and do not have areas for guests to cook food. There is a list of recommended restaurants in the area that can be found on the MICA Guides website. Upon request we can accommodate for up to 3 people in a luxury tent with a $30 additional charge for the third person. Age limit for regular booking is 12 and older. If traveling with children between the ages of 8-11, we may be able to accommodate your family if you book all of our luxury tents. This ensures other guests will not be staying that night. We try to provide a tranquil wilderness experience and don't want small children to interfere with that experience for other guests. Our property is not suited for small children and in no cases can we accommodate children under the age of 8. The full balance of your reservation is due at the time of booking. Should you shorten the length of your reservation within 7 days of arrival or choose an early departure during your stay, you will be responsible for the entire time reserved. We accept most major credit cards. * To receive a starting price at $132 a night you must book a trip with MICA Guides. 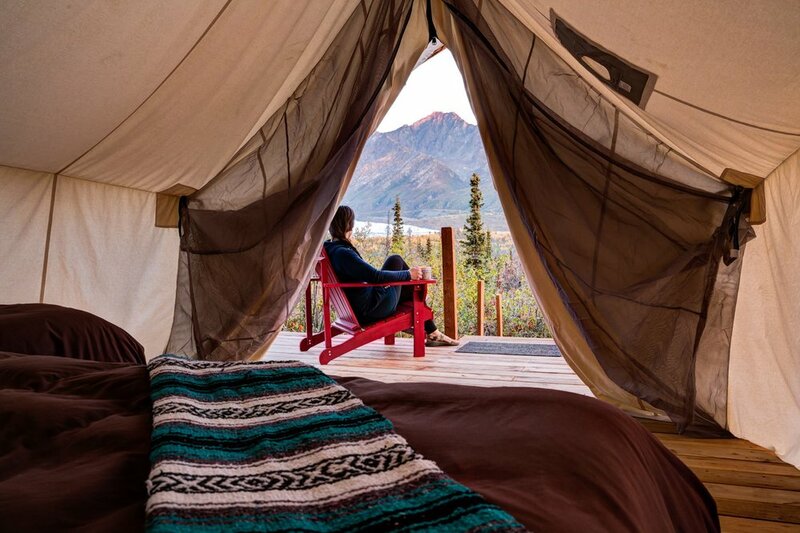 When booking a trip with MICA Guides a promo code is given after booking to use towards your Luxury Camping for 15% off your stay. Please see our packages page for more information.